30% off EVERYTHING Tea Collection + Free Shipping! If you click and buy, I may receive a small commission, thank you! 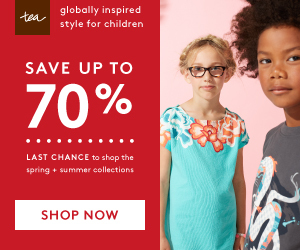 I love Tea Collection clothes and this sale is crazy, so I’ll be stocking up on staples for my kids! Today (Sunday 11/26) through Wednesday 11/29, take 30% off everything and receive free standard shipping (no minimum) when you enter code “MAGICAL” at checkout. Fine Print: Enter code MAGICAL to receive 30% off your order and free U.S. 6-10 day shipping and Canadian 8-12 day shipping. Excludes Every Day Play Sets and third-party items. Offer expires 11/29/2017 at 11:59pm PST. Discount taken will be pre-tax. Cannot be combined with other promotions. No adjustments on previous purchases. Not redeemable for cash. Cannot be used towards the purchase of gift cards. Limited to stock on hand. Thanks for sharing. I love looking at what they have.